Kim Seong-hun's action thriller "Tunnel" arrived last week and managed to capture 40% of box office pie and dislodge "The Last Princess" at the top of the pile. Last weekend Heo Jin-ho's historical melodrama (aka "Princess Deokhye") attracted 1.1 million filmgoers across 964 screens to take pole position; despite following that good opening with another 966,862 admissions here (21%), which moved its total tally now to 3.5 million ($25.6 million), Heo's latest was forced into second place after the "Tunnel" arrived on the scene and attracted 1.8 million admissions ($13.8 million) from 1,091 screens. 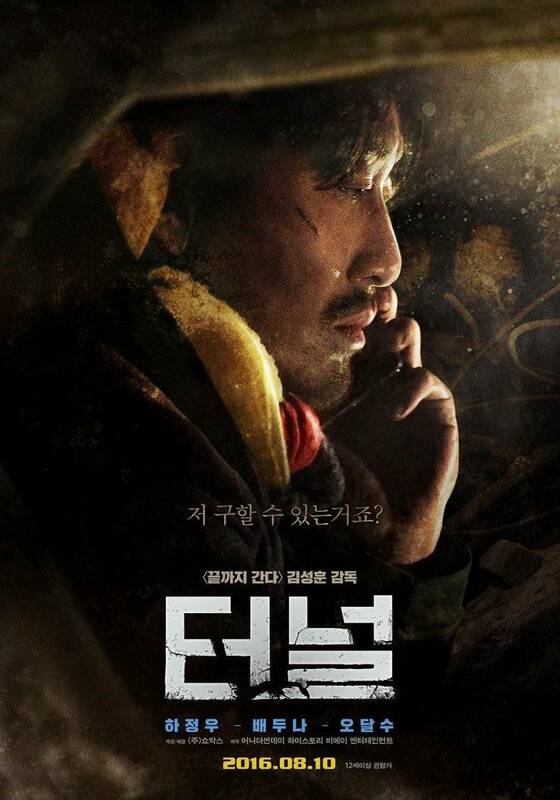 "Tunnel" is based on writer So Jae-won's popular novel of the same name and tells the story of a man who is trapped in a tunnel in a construction site. The film's star, Ha Jung-woo, is joined on screen by other Korea talent including Bae Doona, Oh Dal-soo, and Kim Hae-sook. "Tunnel" has thus far attracted 2.5 million ($19 million) since its release early last week. John H. Lee's controversial wartime blockbuster, "Operation Chromite", starring Lee Jung-jae, Lee Beom-soo, Jin Se-yeon and the Hollywood actor Liam Neeson, added 465,751 admissions (10.1%) to bring its total in Korea now to 6.2 million ($44.1 million). The 3D animated comedy "The Secret Life of Pets" by Illumination Entertainment remained unmoved in fourth place with 368,292 admissions (7.7%), but was closely tailed by the summer's biggest blockbusters: Yeon Sang-ho's first live action film, "Train to Busan". "Train to Busan" (Gong Yoo, Jung Yu-mi, Ma Dong-seok, Kim Su-an) entered the fray late July, and with the 346,035 stubs it found over the weekend, Yeon's atypical zombie drama now moves onto 10.7 admissions ($78.7 million), making it the highest grossing Korean film of the year so far. Other top local hits include: "A Violent Prosecution" (9.7 million), "The Wailing" (6.8 million), "Operation Chromite", and Park Chan-wook's "The Handmaiden" (4.2 million). Kim Jong-hyeon's fourth film "Run-off" (starring Seo-ae, Oh Dal-soo, Oh Yeon-seo, Ha Jae-sook and Kim Seul-gi) also arrived last Wednesday and attracted 262,386 (5.5%) from the 538 screens to take sixth place. The film follows the formation of the Korean women's national ice hockey team and shows the how the women from various backgrounds came together despite various social, economic and political pressures. Kim's previous films include "Little Girl K" (2011), "My New Partner" (2007) and "Mr. Gam's Victory" (2004). DC's antihero team of misfits ("Suicide Squad") fell four places to settle in seventh with 116,258 admissions (2.6%). "Suicide Squad" enjoyed a decent opening weekend last weekend where it captured 16.6% of the box office pie (761,975), but its second weekend out was less successful, and with this week's tally included, the film's bottom line now moves to $13.5 million (1.7 million admissions). Some way off in eighth, and down just two places, was the latest "Jason Bourne" film with 58,920 admissions (1.3%), followed by the 2D Japanese animated adventure: "Detective Conan: The Darkest Nightmare" by Kobun Shizuno. "Detective Conan" (which is based on the manga series of the same name) added an additional 50,088 admissions to bring its total in Korea to 459,210 ($3 million). Lastly, "Bling", a 3D animated co-production between Korea and the United States, was the third new Korean film to entered the charts and did so with 32,115 admissions to take tenth place. Updated cast for the upcoming Korean Web-drama "Thumping Spike 2"